Today is the day of the royal wedding – Prince William and Kate Middleton tied the knot. I like Prince William. Not only does he live on Anglesey (a place I know well) but everyone got a day off work for his wedding. There’s been street parties and flag waving all over the country. Bread and circuses? Yup – that’ll do for me. I’m happy with that. We had a party in the village. Everyone brought food and drink to the village hall (including some home-made cider) and the whole village had a slap-up feast followed by games on the green – five-legged races, welly-throwing, tug-of-war and so on. It was a great day that showed just how eccentrically the British can celebrate when they want to. In the evening I took advantage of the day off work and the fine weather and walked up to the wood. I want to get an idea of the number of badgers at the sett. Hopefully there’ll be cubs soon too. As it happened, I only saw one badger so I’m no wiser about the total number. This badger emerged at 8.15 and snuffled around the leaf litter contentedly for the next 20 minutes or so before wandering off deeper into the wood. There was just enough light for a photo (only just). 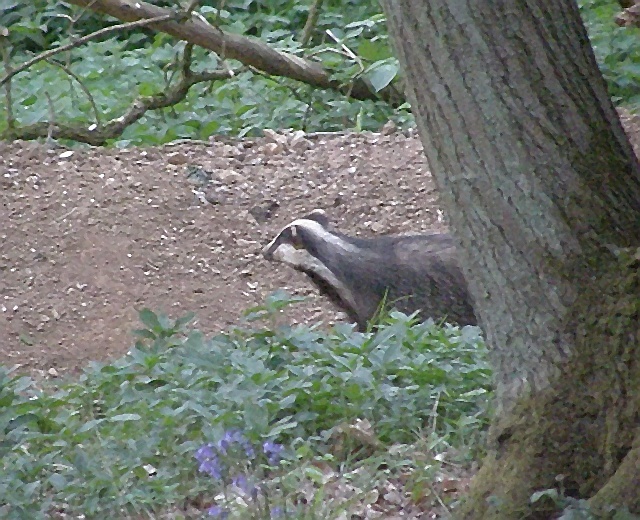 It was a normal, healthy badger foraging for food, but it was on its own. I would have thought Mr Stripey would have come to the party. Never mind. 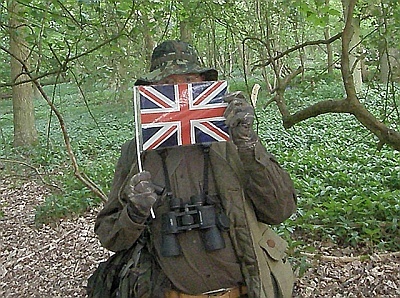 I hope you left the flag at the sett!